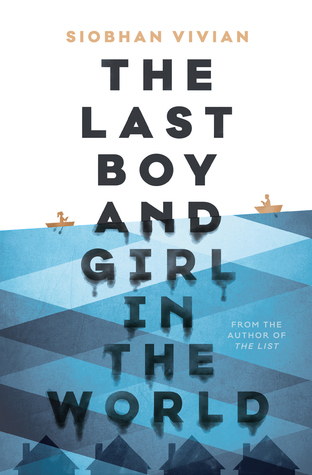 The Last Boy and Girl in the World by Siobhan Vivian + Summer Prize Pack Giveaway! This is such a good read for summer! Okay, I know they haven’t reached summer yet in the story but there’s an abundance of rain/water and that hopeful feeling of almost summer that pretty much every student gets near the end of the year. The Last Boy and Girl in the World isn’t all rainbows and butterflies though so brace yourself for some moments of intense feels! As a main character, I really liked Keeley. Although she was a joker to the point of overdoing it sometimes, she spoke to me on a personal level. I remember being a lot like Keeley when I was in high school. I had quite a few of the internal struggles that she did and most of my love life was just admiring from afar. My heart ached for her when she started feeling the distance between herself and Morgan; I worried for her and her family’s well-being. Keeley sucked me into the story and made me care about what happened to Aberdeen in the end. Shioban hit the mark with the main, young, male characters in this one for me. Jesse is a goofy, always-in-trouble, fun-loving guy that reminds me a lot of a little Labrador puppy whereas Levi is more serious and brooding. What I also realized, upon reflection, is that they not only represent complete opposite ends of the spectrum of behaviour but they also each represent part of Keeley’s character. Yes, she’s fun loving and goofs off however she also knows that some things are serious and can set to work when it’s necessary. Having written both boys this way brings such a nice balance to the story, especially at the end when you have the whole experience to look back on. The ending. Oh the ending. You pretty much know what eventually happens to Aberdeen right from the get-go, what you don’t know is how they got to that point and what the context of that first little section is. It’s an amazing hook! From then on I was like okay, I neeeeeed an explanation for this, like, yesterday. Then I got to the end and it was nothing like I expected. The Last Boy and Girl in the World doesn’t tie up the endings in neat little packages so that you’re happy and everything goes on existing smoothly. This book finishes with questions, uncertainties, memories, and FEELS. Seriously, if you like those satisfying “ahhh everything got resolved and people are happy” ending this one may not fill that need. All the uncertainty though, feels incredibly real. I think when most people finish high school nothing feels all neatly wrapped up. It’s questions and adventures and coping with a million and one changes all of a sudden; and most of us don’t go through what Aberdeen does! Shioban wrote what I think is the perfect ending for this story. It is an ending of reflection and it hammers home one of the main ideas in the book and the last line in the synopsis. As part of the Three Scoops of Summer blog tour, Simon & Schuster also has an awesome prize pack up for grabs! Make sure you enter and keep following along with the tour! Ahh this sounds so good. I love books that are light-hearted but also hit you all the emotions. Gotta add this one to my TBR! It’s such a good mix of things when a book does that! You need the light moments to balance out the feels sometimes. I need more books like that! I’ve heard a lot about this book. Can’t wait to read it!